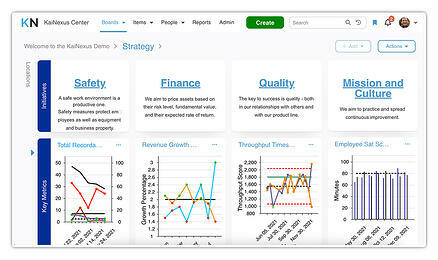 Out-of-the-box, SharePoint won’t spread improvement any better than your spreadsheets and bulletin boards. I’m sure that any IT department worth its salt can set you up to capture improvements electronic suggestion box style, and if they’re feeling clever, they can probably add in some functionality to track progress on those improvements. They can’t, however, build and maintain a system that accelerates improvement throughout the entire improvement cycle. We all know that what gets measured matters. That's why KaiNexus provides configurable templates for resolving every improvement that prompt your people to identify the impact (whether that’s financial or qualitative, like safety and satisfaction) of EVERY improvement, which your finance team can then validate if you want. This way, you have a consistent resolution process from across the organization and the platform can compile accurate reports that enable you to drill down into the impact of all improvement, specific types of improvements, and specific locations and individuals. When your CEO or CFO ask you what the impact of improvement is, are you able to tell them? How long does it take you to compile that information? How confident are you that it's accurate? 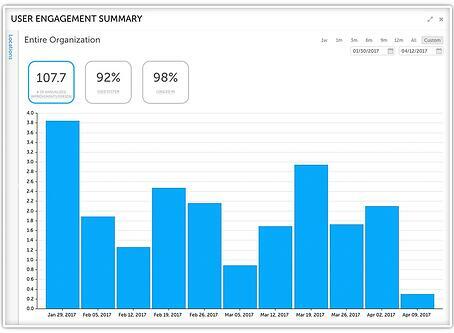 KaiNexus standardizes the reporting process so that people across your organization enter their impact data the same way. You can implement custom a system of checks and balances to ensure that the data is accurate, and track impact metrics in areas like cost savings, cost avoidance, and revenue generation. You can track impact in multiple currencies from locations around the world, compiling accurate reports from across your company. Your impact isn’t the only measurement that matters - you also need to have a firm understanding of the health of your improvement culture at all times. This is where continuous improvement software comes into play. KaiNexus, unlike SharePoint, is able to tell you information like what percentage of your organization is engaged in improvement, who has logged in recently, the percentage of improvements that are in progress vs. overdue, your submission vs. completion rates, who is working on what, average improvement cycle times - and so much more. Each one of these numbers tells you something critical about your improvement culture, and applying this information to your work enables you to provide more targeted coaching to accelerate the rate of improvement. You can tell what improvements have been submitted in SharePoint, and you might even be able to tell what has been completed. You don’t, however, get any more visibility into the nuances of those projects than you did with your spreadsheets. 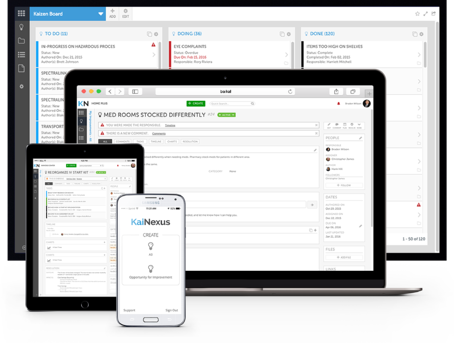 KaiNexus gives you an overview of how improvements and projects are coming along, identifies bottlenecks, and enables you to drill down into the progress of specific initiatives, goals, locations, and individuals. It’s not enough to know when improvements are overdue - you need to be able to anticipate where the problems will be and address them proactively. You can’t accurately plan your improvement roadmap when you don’t have any idea what the workload of your staff and managers looks like. KaiNexus gives you visibility into who is working on what so that you know who can take on more work and who needs help keeping up. It’s common for organizations to have managers enter improvements into their SharePoint application, rather than letting staff enter their own, so that the process and formatting are consistent. The problem with this is that you lose a lot of opportunities for improvement when staff are required to take the time to discuss with a manager, your leaders get overwhelmed and fall behind with all of the idea (thereby reducing future engagement), and staff have no visibility into the status of their ideas or agency to implement the changes themselves. KaiNexus, on the other hand, provides a standardized way to submit any type of improvement that you can customize to fit your own process and terminology. Everyone can get involved in improvement from the moment the idea is captured until a resolution is logged and shared. This results in much a much higher level of engagement and a greater impact than restricting access with a SharePoint application. Once an improvement is completed and logged in your SharePoint application, chances are that your team moves on while the improvement gathers dust and is eventually forgotten. KaiNexus makes it easy to share the idea across the organization at the moment it’s completed, breaking down silos and ensuring that each improvement is implemented across the organization for the maximum impact. After it’s shared in that initial burst, it joins all past improvements in a knowledge repository that is easily searched by others. The software takes an active approach to knowledge sharing, with alerts that notify people when they're submitting an improvement that is similar to work someone else has already done. In this way, your organization develops a permanent body of knowledge that is used as the basis for all future improvements, freeing people up to work on new initiatives rather than constantly reinventing the wheel. Visual management is perhaps my favorite element of improvement software. 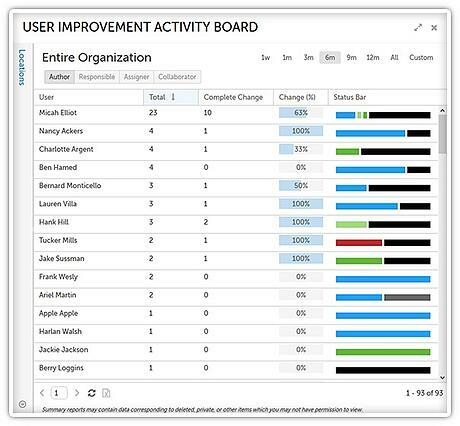 While a SharePoint application might store information for you and act as a basic collaboration tool, continuous improvement software gets that information out of the hard drive and onto a monitor on boards displayed around the organization. Your Huddle Boards, Kaizen Boards, Idea Boards, Strategy Boards, and all other bulletin boards can be replaced with a digital version that pulls information from the platform to update improvements in real time, display KPIs, and track data. You can view them on your computer or on a giant monitor on the wall in a break room, making sure that improvement stays at the forefront of the organization without wasting time constructing detailed paper board. This is the least interesting element to talk about when comparing SharePoint to improvement software, but it is perhaps the most important in terms of saving your organization time and money. Developing a SharePoint application as robust as off-the-shelf improvement software would take a team of developers years of work and millions of dollars to create. We know because we’ve done it. In comparison, configuring KaiNexus to match your existing workflows and language to accelerate the spread of improvement without backsliding on the progress you’ve made already takes a couple of hours during your implementation period. Our team works hand-in-hand with yours to ensure that the process and terminology look familiar to your staff, and functions according to your specific needs. We make sure you're fully trained, and partner with you to ensure long-term success. Learn more about our Customer Experience philosophy, onboarding, training, and support here. I firmly believe that in order to be successful in today’s economy, you need to identify your primary goals and align all business efforts toward achieving those goals. Your goal might be to provide the highest quality of patient care or to deliver high-quality products on time. It is toward these ends that you should be devoting your time and resources. Our goal is to provide a platform that accelerates the spread of improvement. That’s it, plain and simple. If that’s not YOUR goal, developing a SharePoint application to serve as continuous improvement software is a waste of resources and a distraction from achieving your true goals. When a solution is available immediately, and at a fraction of the cost of building your own, doing anything other than signing up and getting started would be foolish. Continuous improvement is hard. Why not set yourself up for success, with the right tools?